CHRISTMAS STOCKINGS. IT’S SEW TIME. Hello Christmas! Louise is here to show us how to make a stocking. Get ready to stuff it, Santa. This is a really quick and easy tutorial that would suit beginner sewers. 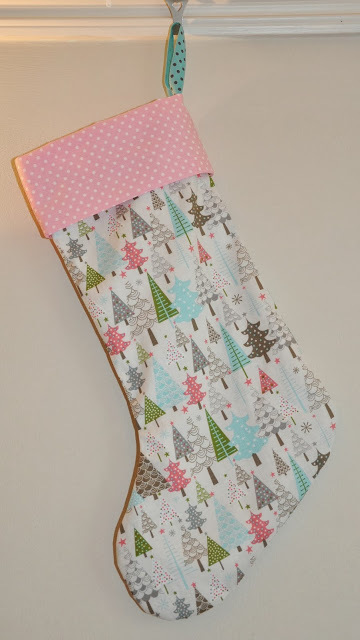 Make a gorgeous Christmas Stocking out of your favourite fabrics! 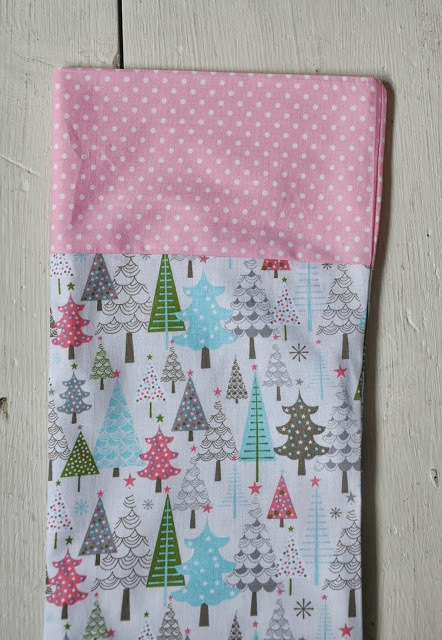 We stock a selection of Christmas fabrics at Sew Scrumptious although they are selling out fast. 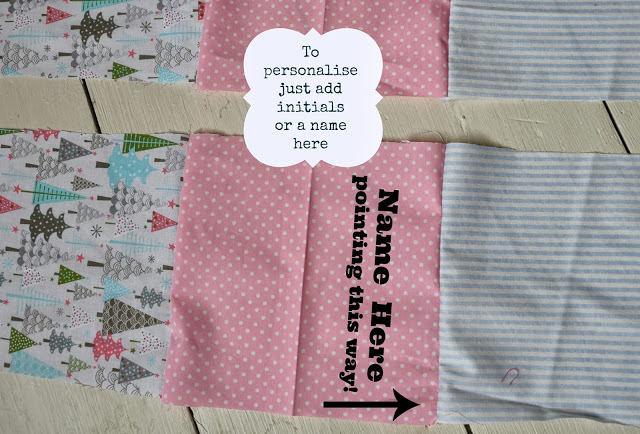 You can use non Christmas fabrics too (how about using this gorgeous fabric for example. 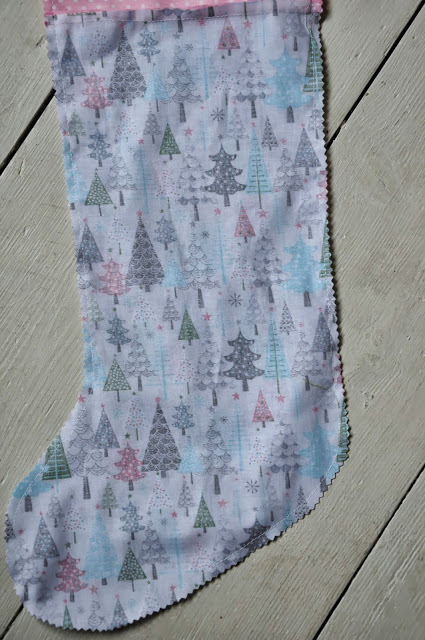 The stockings are fully lined and would make great gifts. 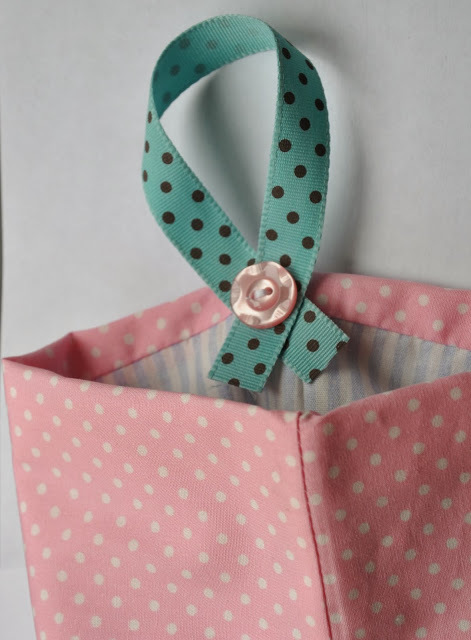 A buttonYou can download and print out the free pattern from the Sew Scrumptious website here. Match up the arrows and stick the two A4 pieces of paper together using sellotape before cutting out your 2 pattern pieces. You should have a main stocking pattern and a stocking cuff pattern. Fold the main fat quarter in half and cut out 2 stocking shapes from the main fabric and then 2 from the lining fabric. Stocking cuff – cut 2 pieces on the fold of the fabric. 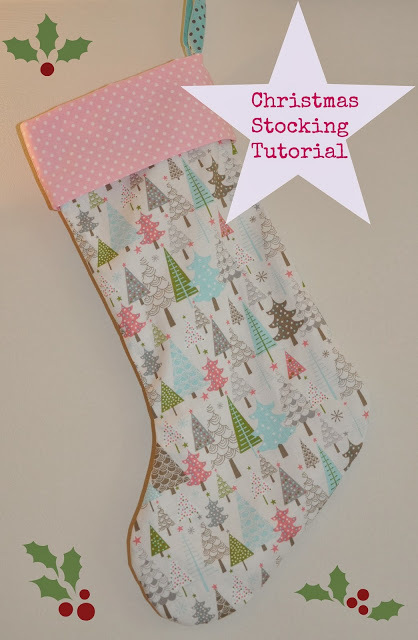 Place the long edge of the stocking cuff face down on the top of one of the main stocking pieces and sew along the top using a 3/8″ seam allowance. 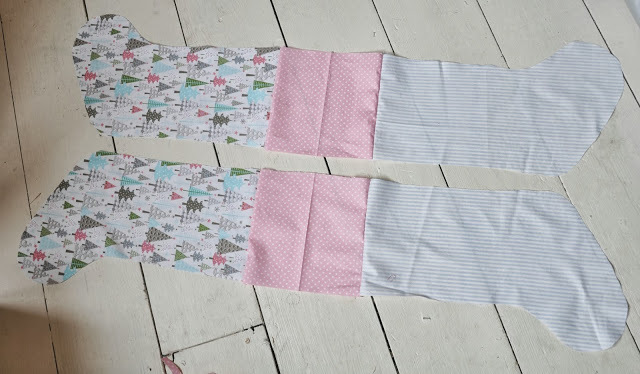 Repeat with the other side of the cuff but sew on to a lining stocking piece. You should end up with a piece of fabric as shown below. Press the seams to the middle. Make sure that the foot pieces are facing the same way. Repeat with the remaining pieces of fabric. Place the two pieces face down on top of each other (patterns facing) and pin all the way around. 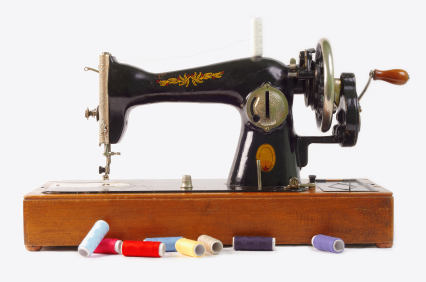 Start at the base of the lining foot and sew around the foot, up the leg, around the other foot and down to the bottom of the lining foot again. Make sure you leave a small turning gap in the bottom of the lining foot. 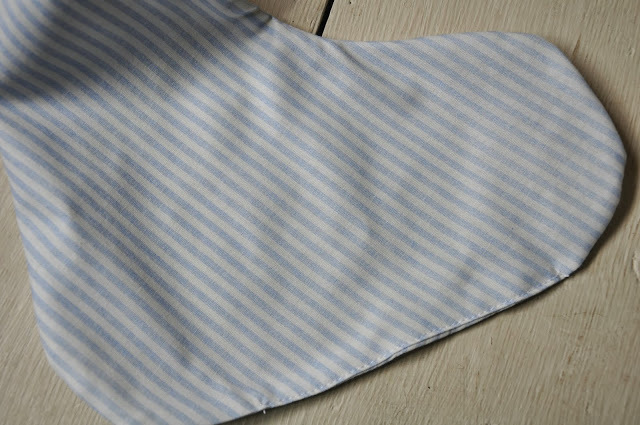 Trim the fabric all the way around using pinking sheers to prevent fraying and reduce bulk. 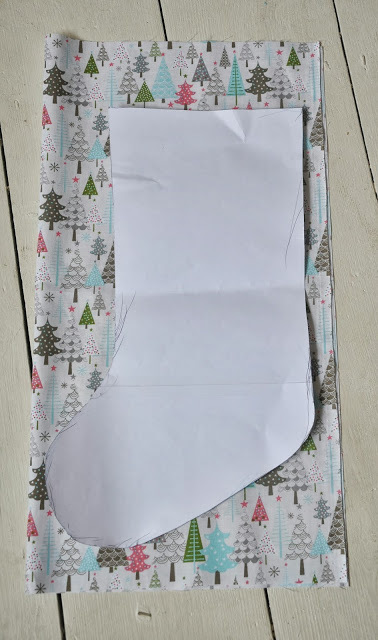 Pull the main stocking fabric through the gap in the lining foot and turn everything inside out so the right sides are now showing and press. Sew up the turning gap. Push the lining fabric back inside the main fabric until the lining ‘foot’ is neatly inside the main stocking foot and everything is nice and neat. It should look like this at the top. Fold over the stocking cuff and work out where you want your hanging loop. 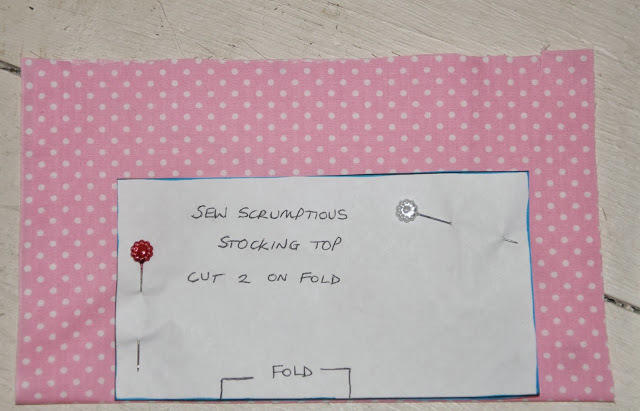 Add a loop of ribbon and a button for decoration on the inside of the stocking. The stitching will be hidden on the back by the stocking cuff. To personalise the stocking, just add a name or initials to the stocking cuff. Just make sure that you place them on the right way so that when you turn the cuff down the letters are the right way up. You also need to think about which way you want the stocking foot to face. Here is the finished article ready to hang on the mantelpiece! 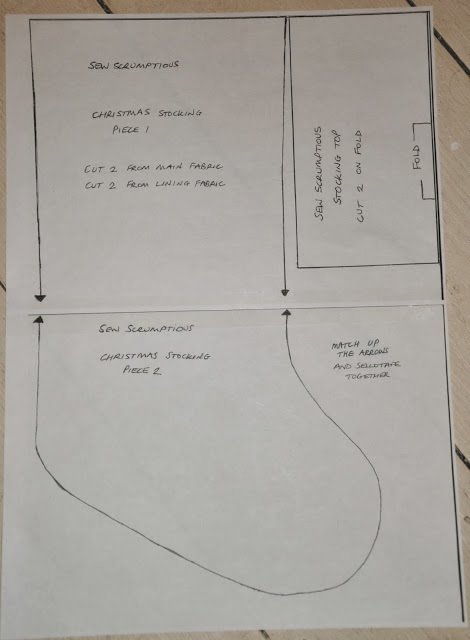 If you make a stocking using this pattern, please send me a photo. I would LOVE to see them! See more Sew Scrumptious tutorials here. Sew Scrumptious sell seriously super fabrics. (If fabrics began with an S that alliteration would have been flawless.) Click on the picture below to be taken into a world of fabric wonderment. 0 Responses to Christmas Stockings. It’s sew time.